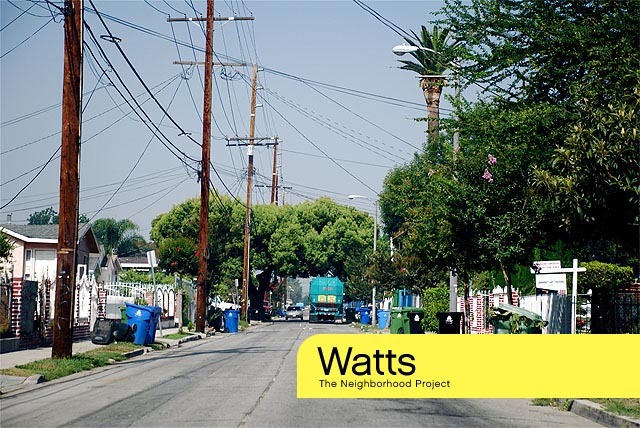 The Watts area of Los Angeles is located in South LA, and is fighting to change the infamous reputation the area has for gang violence, and riots. Named after Charles H. Watts, the area has always been a haven of affordable housing that attracts mostly the working class. 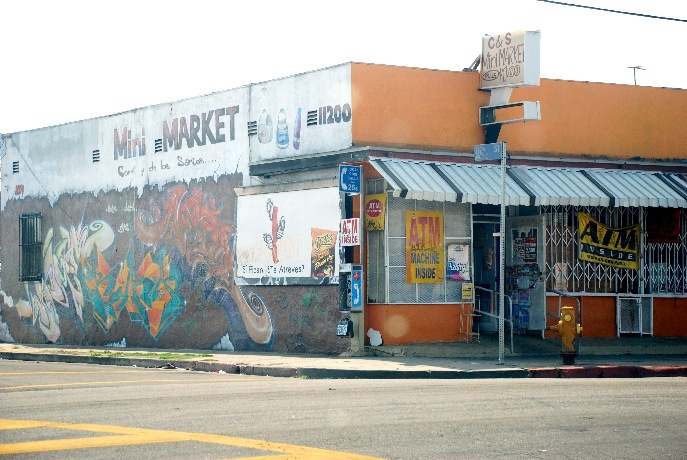 With small single story one or two bedroom houses, and housing projects, the Watts community is tightly knit. 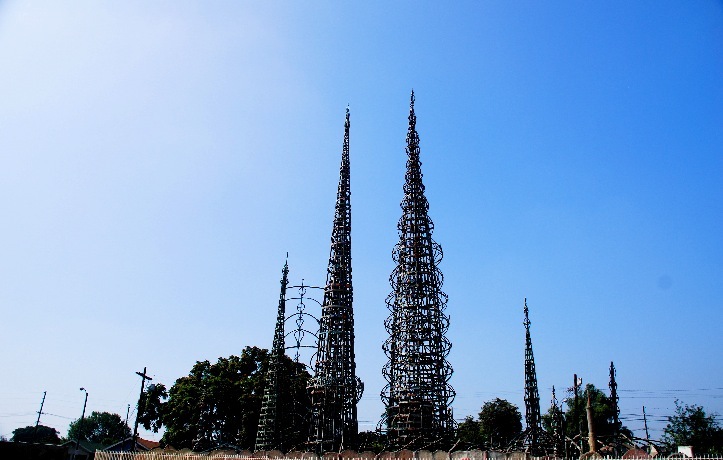 And being home to the Watts Towers, one of 4 nationally recognized historical landmarks in Los Angeles, Watts is a distinctive community with a unique history. Boundaries: The district&apos;s boundaries are Century Boulevard on the north, Mona Boulevard on the east, Imperial Highway on the south, and Central Avenue on the west. The eastern boundary of Mona Boulevard is sometimes stretched to Alameda, depending on the source. Congrssional District 37, formerly represented by Congresswoman Juanita Millender-McDonald, and currently is a vacant seat due to the passing away of Juanita Millender-McDonald in April 2007. State Assembly District 51, represented by Curren D. Price, Jr. There are a few main streets for getting around including Santa Ana Boulevard; Compton and Wilmington Avenues running North/South; and 108th Street runs East/West. There are several buses for public transit, as well as the Blue Line and Green Line of the Los Angeles Metro system. The area is also bordered by the 105 (Century Freeway) giving the area plenty of freeway access to the rest of the city. In 1926 the incorporated City of Watts voted to annex itself with the City of Los Angeles, and began to be settled by mostly whites and Mexican-Americans who worked on the railroad, but gradually became an almost all black neighborhood by the 1940&apos;s.
Photo of Watts in 1912, from the Los Angeles Library public domain. 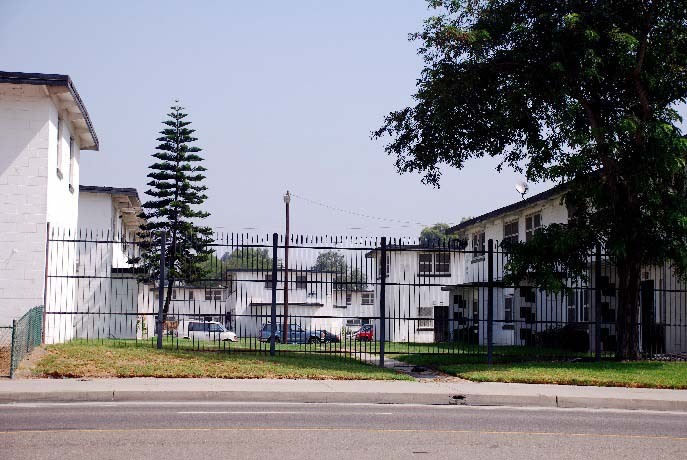 During WWII the Jordan Downs, Imperial Courts, and Nickerson Gardens housing projects were built. The Nickerson Gardens housing project being the largest of its kind west of the Mississippi River. These housing projects would later be the birth place for such gangs as The Grape Street Crips, The P Jay Crips, and the Bounty Hunter Watts Blood Gang. The community&apos;s perceived harassment by police officers and lack of adequate public services such as hospitals and schools led to the mood that was just right for a riot. The violence erupted when a black youth was arrested for a DUI by a CHP officer, sparking outrage in the community, leading to the now infamous Watts Riots in 1965. The 70&apos;s did not fair well for the Watts Community either, when the Bloods and Crips rivalry took the area hostage. Between 1985 and 2005 LAPD reported 20,000 gang related homicides in the area. Only offering a break during the 1992 truce that followed the L.A. riots stemming from a non-guilty verdict of white officers on trail for beating Rodney King, and being filmed doing so. 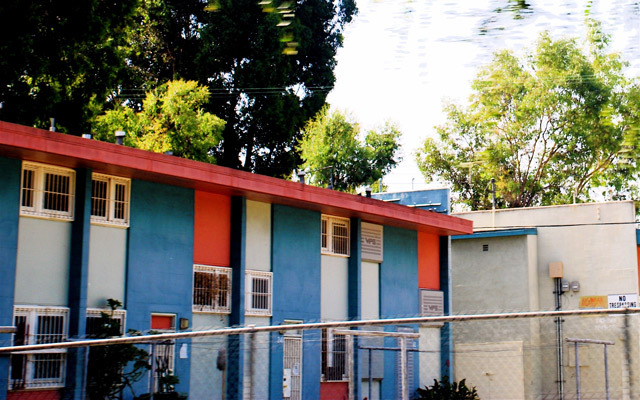 Each of the three major gangs in Watts was born out of a separate housing project. Nickerson Gardens gave birth to the Bounty Hunter Watts Blood gang. 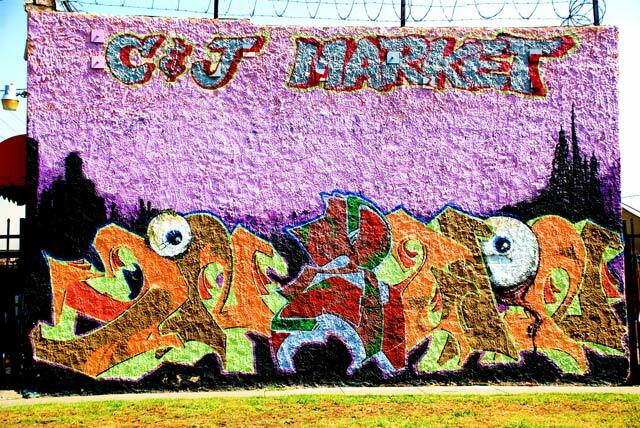 The Jordan Downs project gave birth to the East Side Grape Street Watts Baby Loc Crips. The Imperial Courts giving birth to the P Jay Crips. Obviously whatever housing project you ended up at determined which gang you would end up being affiliated with. In recent years community leaders have tried to give extra attention to museums and the Watts Towers, hoping to bring visitors to the community and help lift the negative stigma that Watts has. And the number Mexican-American residents has been on the rise in the Watts area again, competing with the majority black population. 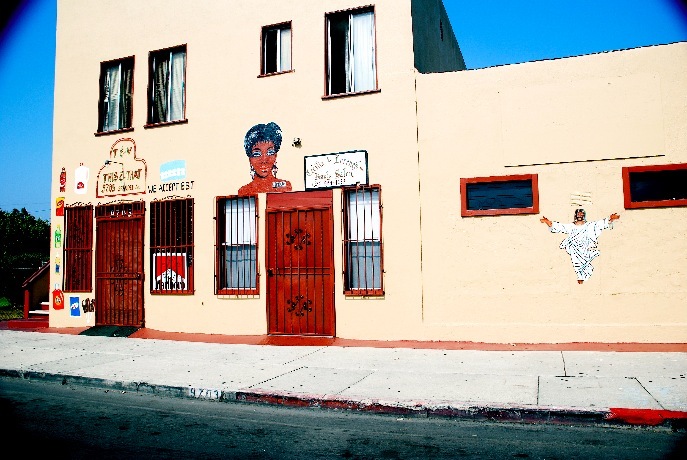 The East Side Grape Street Watts Baby Loc Crips, of Jordan Downs, originated as a mix of Mexicans and Blacks, but the Mexicans left to align with Sureno. Their main rivals are the Bounty Hunter Watts Bloods. They wear purple in addition to the typical blue crip colors, and often wear Lakers hats. The purple stands for Grape. They have several cliques that include the following: Baby Locs, Peta Roll Squad, Peta Roc Squad, Peta Loc Squad, Parolee Squad, 95th, Bandera Blocc 97, 103rd, Dust Town Crip, Dust Town Hoggs, and Tip Top. That wall belonged to a Auto Repair Shop. 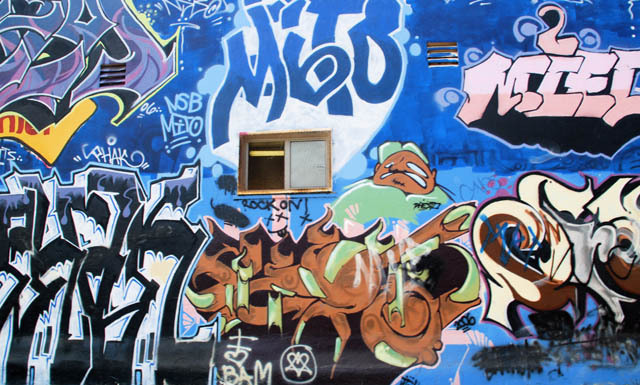 The graffiti in this area comes faster than cob webs. 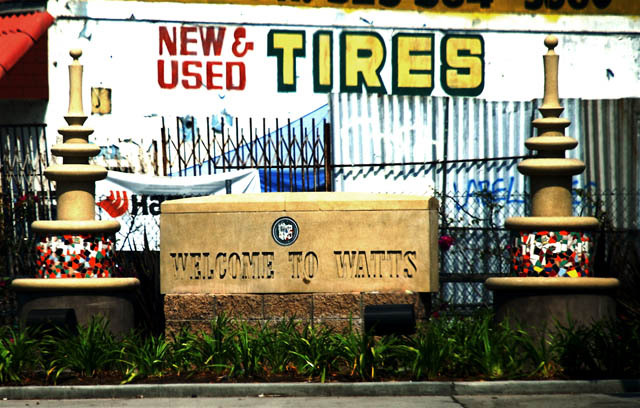 The P Jay Watts Crips (ProJect Watts Crips), from the Imperial Courts Housing Project, most notably set up the non-profit association "Hands Across Watts", in order to keep the peace between the different street gangs in Watts during the 1992 truce. They have had an ongoing feud with the Grape Street Crips since 1987. They wear the traditional blue crips colors. The gang consists of four cliques: Bull Side Crips, Funny Side Falcons, Island Side Crips and Pill Head Crips, who have got other sub-sets in their turn: Bricc Mafia,Jacc Mob, Squad Up, Tha GK (Grape Killa) Boys, Pure Players Squad and Murder Squad D-Boys. 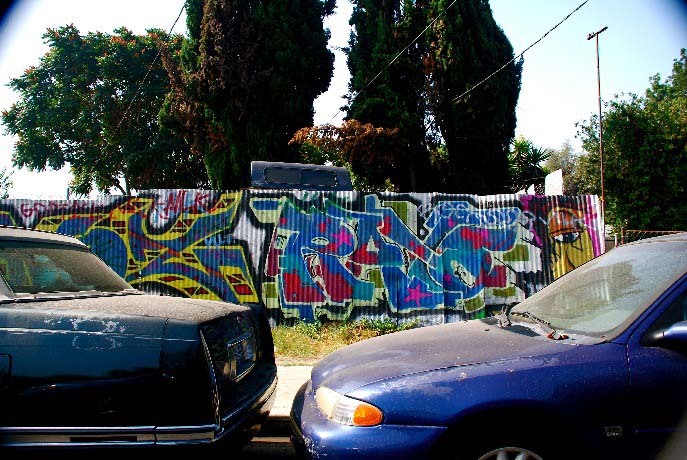 Taggers drop bombs along the walls that follow the train tracks. The Eastside Bounty Hunter Bloods from Nickerson Gardens were firmly established by 1972, and occupying an area of 0.54 square miles makes them the largest Black gang territory in Watts. Subsets include: Lot Boys, Block Boys, Bell Haven, Ace Line on 111th Street, Duece Line on 112th Street, Tray Line on 113th Street, Four Line on 114th Street, and Five Line on 115th Street. Store owners are smart to work WITH the graffiti guys, maybe that will work. 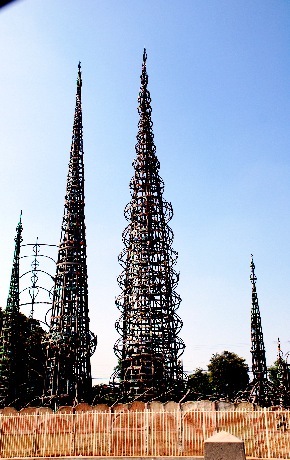 It took italian immigrant Sabato Rodia 33 years to build what are now known as the Watts Towers. He constructed the towers in his spare time, with bed frames, bottles, ceramic tiles, scrap metal and sea shells. The towers are a collection of 17 inter-tangled structures, the tallest of which are about 100 feet high. At the time Rodia&apos;s neighbors did not appreciate his towers, and thought they were ugly. Others thought it was some kind of secret government spy antennae. This resulted in Rodia being harrassed and the towers being vandalized. 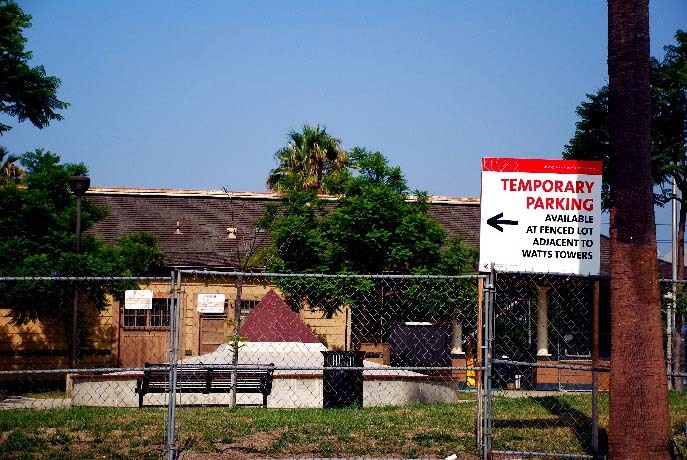 Sick of it all, Rodia eventually gave the property away, and moved to Martinez, CA never to be seen in Watts again. 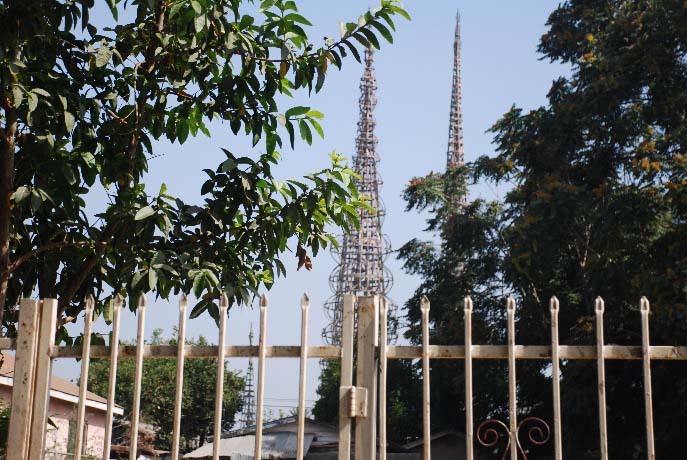 The city was all set to demolish the Watts Towers, Rodia&apos;s home had burned down, and it seemed like the end for the Watts Towers, but a Curator from LACMA and prominent actors, film editors, artists and architects formed the Committee for Simon Rodia&apos;s Towers in Watts, and negotiated with the city to test the structure&apos;s stability, and eventually were granted permission to restore the site. 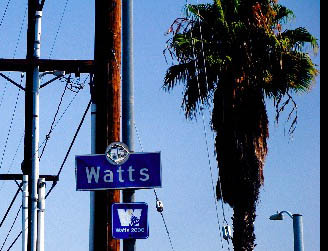 Watts in Popular Culture: The Watts area is no stranger to TV and Movies. The TV series "Sanford and Son" was based in Watts, and "Fred Sanford" played by Redd Foxx made numerous references to problems in the community, such as the high crime rates, and lack of government assistance. The Watts Towers also are a popular part of Watts to put into movies or TV shows, being featured in HBO&apos;s "Six Feet Under", The Game&apos;s "Love Me or Hate Me" music video, Don DeLillo&apos;s novel Underworld, even in the popular video game Grand Theft Auto: San Andreas. Local Businesses often have folk art painted right onto the building. 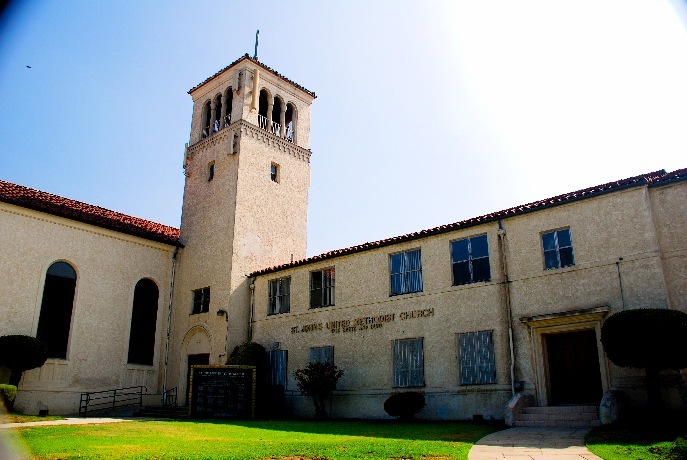 St. James United Methodist Church sits across the street from the Watts Towers, and is one of the largest building in the area. Home to lots of local graffiti artists, Watts appears to have bombs on every blank wall you see. On hot summer days the candy bars in most of the corner stores, like this one, are melted little puddles, and again notice the extensive graffiti in this area. The Watts Senior Citizen Center was buzzing with activity. 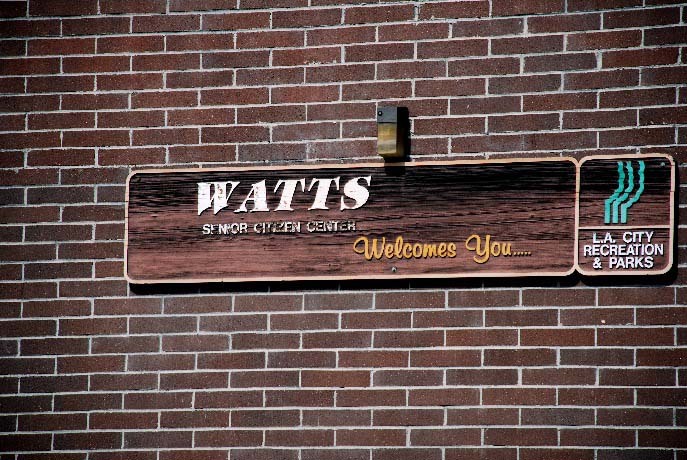 Watts has a lot of older residents, and they are likely to be seen entering and exiting this building. 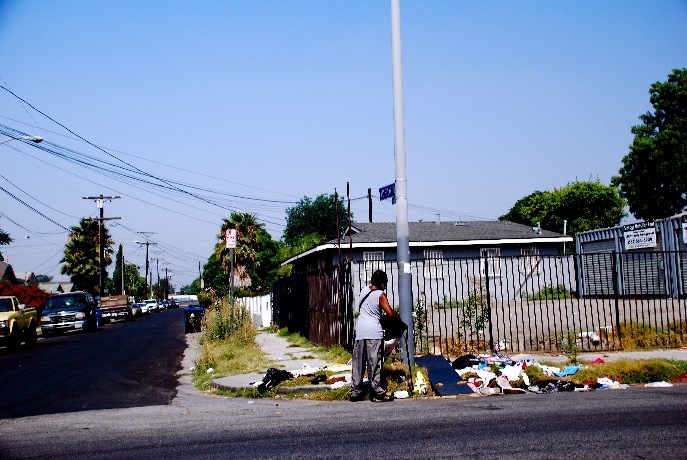 A local Watts resident looks through a pile of debris on the corner, in search of salvagable items that may be of value. 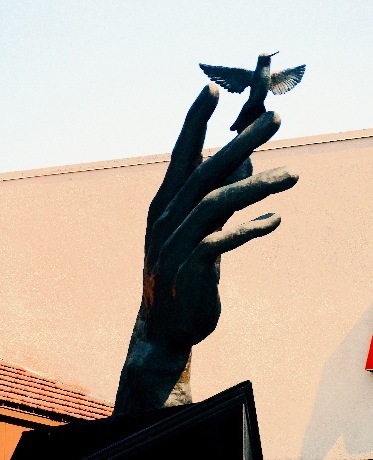 This sculpture is located in a shopping complex near the 103rd Train Station. 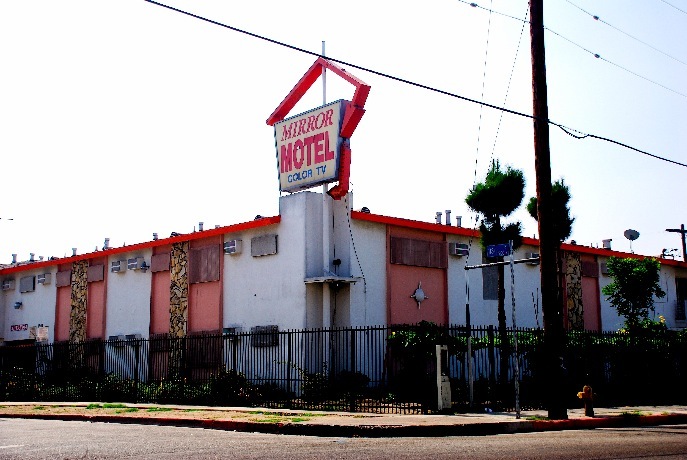 Mirror Motel is a typical example of the motels available in Watts. As you can see in their sign, the only thing they have to boast about is that the TV&apos;s are not B&W. That and the 70&apos;s building decor. 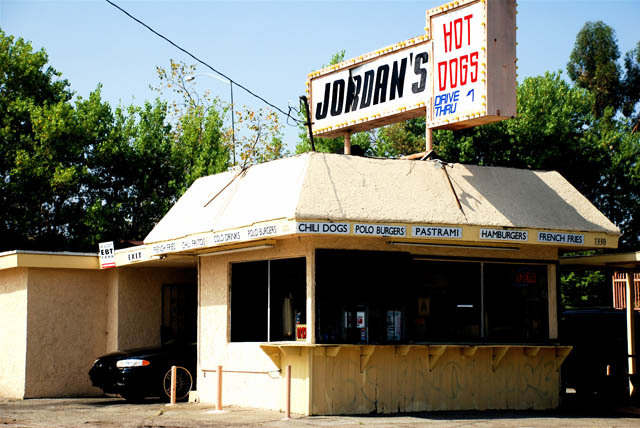 Jordan&apos;s is a drive-thru hot dog stand, yes like Wienerschnitzel, but much much tastier. Go for the chili dog, you know you want it. 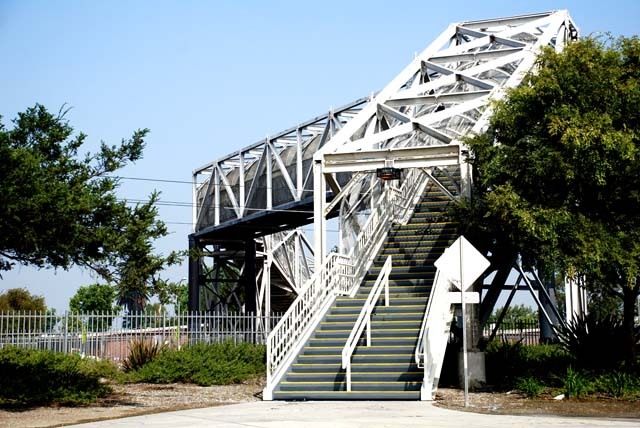 A pedestrian bridge to help local residents navigate across the dangerous train tracks without any harm. 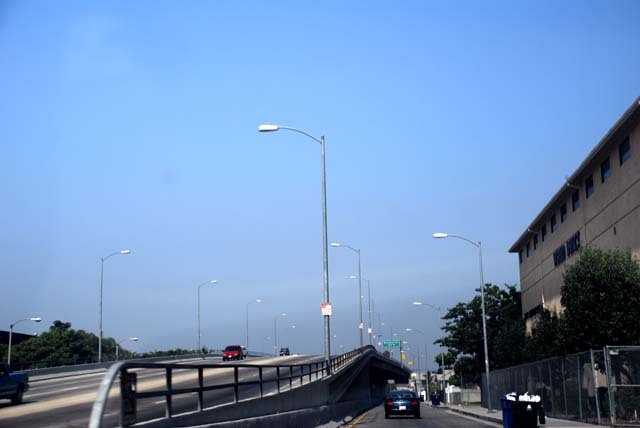 Entering The Watts area from the East on Imperial Highway. This sign needs no caption.